Proud moment to OUE. We congratulate you as a District. Mary Paquette is a 5th grade math teacher at Oologah Upper Elementary School in Oologah, Oklahoma. She faces the same balancing act that many other teachers face, teaching the standards in accordance with the district scope and sequence or pacing guide, while also addressing the individual needs of each of her students. Through planning and trial and error and with the help of online tools, Ms. Paquette has created a personalized learning environment to help her students achieve success. In this article, we’ll share what a typical day looks like in Ms. Paquette’s classroom and then break down some of the components that really make her classroom work. The first step to providing personalized instruction is understanding each student’s current learning level, strengths, and needs. To do this, at the beginning of the school year, Ms. Paquette’s students take the Edmentum Exact Path adaptive diagnostic assessment to determine each student’s instructional level across the entire range of K–12 math skills. She uses Exact Path and Study Island as the backbone to her curriculum. Study Island provides grade-level, standards-based formative assessment and practice to keep a consistent pulse on mastery of the standards and each student’s preparedness for Oklahoma’s state assessment, the OSTP, and Exact Path provides an individualized learning path of instruction and learning activities to close specific skill gaps whether students are working on, below, or above grade level. Through the use of both of these programs, students are learning the standards based on the district pacing guide while addressing their individual needs. At the beginning of each week, Ms. Paquette introduces a new topic using Study Island. After about 20 minutes of instruction and Study Island practice, the class transitions to independent work time. Ms. Paquette pulls small groups of students for reteaching and review on the study Island topic they learned, while the rest of the students work on their individualized learning paths in Exact Path. This cycle continues throughout the week. At the end of every class, Ms. Paquette splits up the students into groups of four to five to work on what she calls “challenge questions” based on skills that need to be reviewed. While the students are working, she checks in with each group and asks questions to help guide them to full understanding of the concept. By the end of the week, each student is expected to have completed at least two skills on his or her Exact Path learning path and to have demonstrated mastery on the Study Island topic the class learned that week. Every two weeks, each student is expected to complete an Exact Path Progress Check, which assesses mastery on up to four skills at a time. The results of these activities are part of each student’s grade in the class. In Ms. Paquette's classroom, establishing a positive community is critical to success. To circumvent any disruption during the lesson, she leaves a clipboard at the edge of her chalkboard where students write down what they would like to go over during their roundtable. The students respond well to this, often sharing what is working and what is not working for them as well. Ms. Paquette knows that, for personalized learning to be successful, her students must take ownership of their work. With the expectation to complete two Exact Path skills a week, students must maintain responsibility, focus during class, and practice time management. If students are struggling to get to their first quiz (which comes at the end of each skill) by Wednesday, they are encouraged to work on it at home so that they can reach the goal. For students who don’t have Internet access at home, Ms. Paquette allows students to come into the classroom during recess, but it’s the responsibility of students to show up if they need the extra time. To promote engagement while students are working independently on Exact Path, students have a divided folder to use for note-taking, working out problems, and writing down questions while they are working. These folders help students pay closer attention to what they are learning and serve as a resource for them to review topics later. Ms. Paquette has also come up with a unique way for her students to recognize that they need additional help. "You know when someone would advertise for something, and they have the tabs that you tear off to take their phone number? I have little sheets for my students to use that are similar to that," Ms. Paquette said. If students fail a quiz on Exact Path, they pull a tab off and fill it out with their name and the skill they need help on. Then, they put it in a basket, and Ms. Paquette goes through the tabs the next day to help form small groups. Although this data is easily accessible within the Exact Path educator interface, it’s important for students to recognize when they need help and to ask for it. Not only do the tabs help Ms. Paquette keep track of which skills the students need help on, but also students gain confidence to ask for the help they need and to take ownership of their growth. Most of her students look forward to these small groups and appreciate the help. They can then go into the quiz for a second time assured that they have made progress on the skill. "Last year, I had so many kids say thank you to me at the end of their small group because they were struggling but excited that they finally understood the concept, and I think that's really cool," Ms. Paquette said. Another way Ms. Paquette keeps her students engaged with their lessons is with their class vocabulary tree. During their Exact Path lessons, if students come across a vocabulary word they don’t know, they look up the definition of the word and write it down on an index card for the vocabulary tree. At the end of class, they get to teach the word to the class, and they become the "expert" on that word. If anyone needs to know what the word means moving forward, they know whom to find. 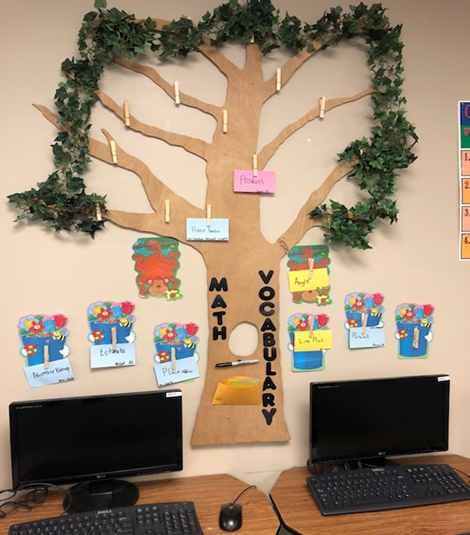 The students then add their vocabulary word to the tree in the hallway as well and put some examples of the word in their notes. "Some of these kids just love it. They want to put the vocabulary words up because they are actually listening to the lessons," Ms. Paquette explained. In addition to helping struggling learners and those working at grade level, personalized learning has also proven to be useful for Ms. Paquette's more advanced learners. Students whose placements are at the 6th and 7th grade level based on their Exact Path adaptive diagnostic assessment results are also able to achieve growth. They are receiving instruction that is challenging and rigorous for them. When students struggle, Ms. Paquette uses the instructional resources within the program to help her students understand the advanced concepts. In addition to her 5th grade math classes, Ms. Paquette is also the lead instructional technology teacher. In this role, she trains other staff members using videos she has created. She meets with teachers one on one and improves their knowledge of Exact Path so that they can also use it for personalized learning in their classrooms. 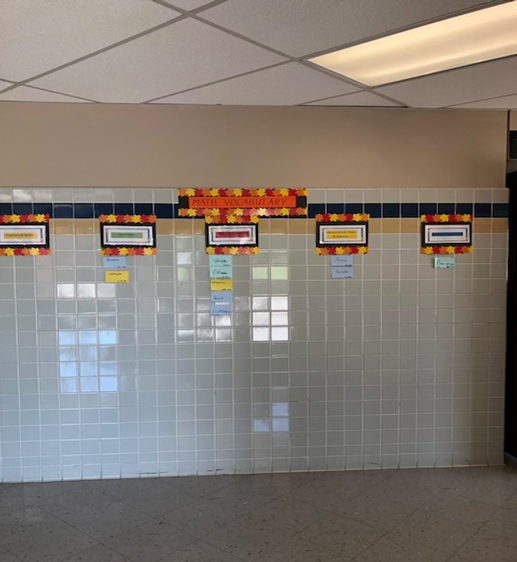 Ms. Paquette and other teachers at Oologah Upper Elementary School are beginning to shift their focus from number and letter grades to a competency-based learning approach. Eventually, they want report cards to reflect this as well. Ms. Paquette is doing some incredible things with personalized learning in her classroom, and based on her data, the students are benefitting. Not only are they progressing in academic growth, but they are also learning to take responsibility for their learning journey, which will set them up for success in their future endeavors. Mary Paquette currently teaches 5th grade at Oologah Upper Elementary in Oologah, Oklahoma. 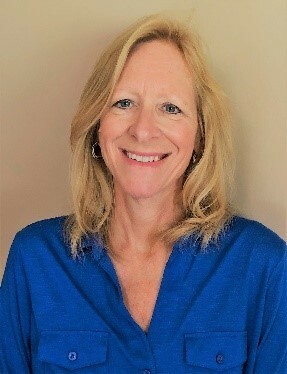 She has taught for 24 years with 5 years of experience in Houston, Texas, 8 years in Madison, Wisconsin, and 11 years in Oologah, Oklahoma. She has taught kindergarten, 3rd grade, 4th/5th combination grades, 5th grade, and 6th grade. While in Madison, Wisconsin, she had the opportunity to team with the University of Wisconsin in a study of how students learn math through Cognitively Guided Instruction (CGI) as a research participant. She also traveled to the Netherlands to a math institute in Mathematics in Context (MIC). She is now implementing personalized learning in her classroom using Exact Path, Study Island, NWEA™ Map®, and other online resources.